Students have gathered on these front steps for decades. When these students pulled together for this picture I got a little choked up. There is a faithfulness that spans generations, which enables students to continue meeting on these steps. We are thankful! We are thankful for the way the Gospel has impacted lives and Hillcrest, and continues to this day. There is a unique generosity that propels Hillcrest forward, helping us give more kids the opportunity to meet on these steps. We are thankful in this season for what God has done and is doing in the Castle on the hill. There is an incredible wave of support that enables us to impact the lives of students for Christ at Hillcrest. The impact is in the transformative power of the Gospel. 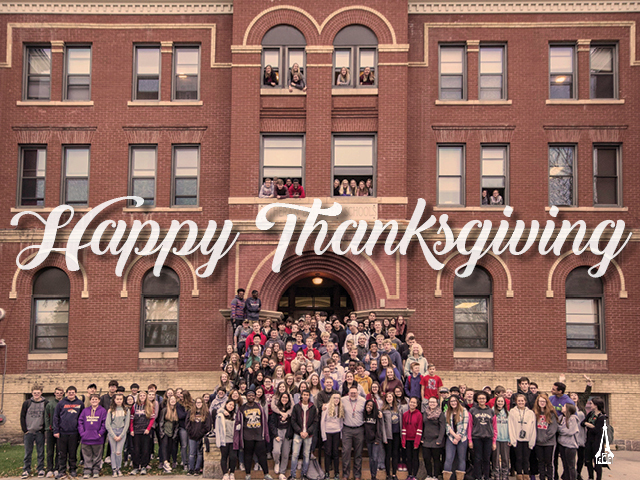 We are so thankful for you in your interest and support of your school, and for the ongoing investment many make financially and in service, leading Hillcrest to more expansive horizons that hold even more opportunities for us to share the life-changing message of the Gospel. I invite you to witness a small glimpse of the transformation taking place on campus, at our annual Christmas Concert on December 8 and 9, at 7pm, at Bethel Lutheran Church. These front steps, as you know, lead to classrooms, dormitory rooms, teachers’ offices, and many other places where students build faith, develop intellect, and strengthen character with a cherished Gospel perspective. It’s with joy that I say thank you, but it is with a chorus of thanks from Hillcrest students who are continuing to gather on our front steps, 100 years and counting, that we celebrate what God is doing at our school. 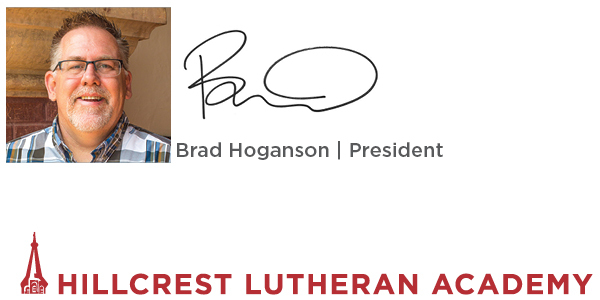 Our hearts are full of thanksgiving for your continued partnership with Hillcrest Lutheran Academy. Happy Thanksgiving!